Every smile is unique and beautiful to our team here at Panhandle Dental Care. We don’t think every smile has to look the same to share joy, warmth, and love. In fact, we celebrate everything that makes you, you! Cosmetic dentistry isn’t about changing who you are, but more about enhancing that uniqueness. We also know that even if we think your smile is wonderful, you may not. And when you feel self-conscious about your smile, you sure won’t be sharing it with the world the way you should be – and that means you are missing out on a lot of the benefits smiling brings to your life and to the lives of others. 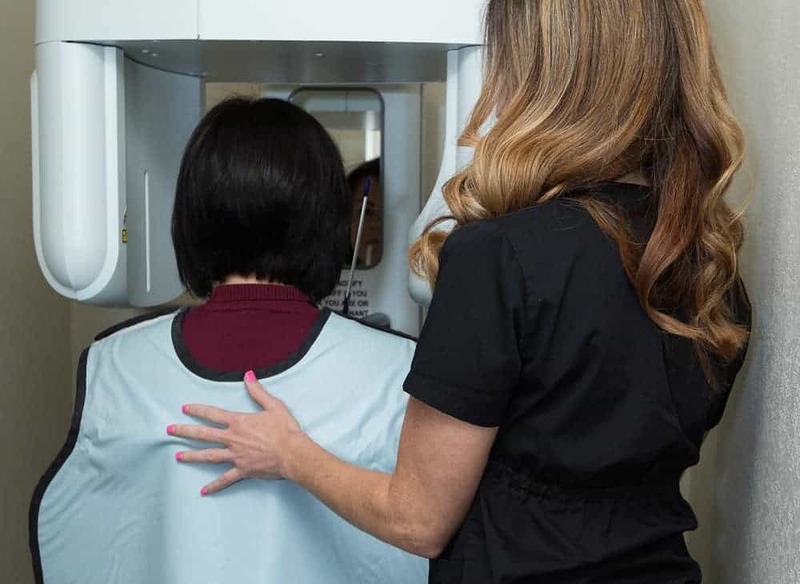 That’s when the right approach to cosmetic dentistry can make the changes – large or small – that offer the health and confidence you deserve and need. Smiling is important. It is not only good for those around you, it is good for your own physical and emotional health. It can even make you more efficient! And while all of that is great news, if you are hiding your smile because you feel embarrassed by discoloration, wear, broken teeth, or too much gum tissue, you are definitely not using your smile to its full advantage. In fact, we have worked with lots of patients who spent so much time hiding their smiles, they actually forgot how and had to relearn smiling from scratch once treatment was complete! We can even combine any of the procedures you may need for a full-mouth restoration. The truth is, all of our dentistry is performed with an eye, not only on restoring health, but also on appearance – and vice-versa. Panhandle Dental Care believes that health and beauty are perfect companions and our dentistry proves it. Dental veneers are one of Panhandle Dental Care’s most comprehensive cosmetic dentistry solutions. Made of beautiful, dental-grade porcelain, veneers work just as the name suggests by creating a perfect, new surface over your own teeth. This new surface looks just like a natural tooth with all the layers and light-reflective qualities nature intended your smile to have. These gorgeous restorations are ideal to cover deep staining or discoloration, repair and strengthen broken teeth, close minor gaps, correct irregularities, or lengthen short or worn-down smiles. Depending on your needs, we can use one or a whole arch of veneers to create the smile of your dreams. Is your smile in need of a little extra TLC? Then talk to us about one of our cosmetic full-mouth restorations. 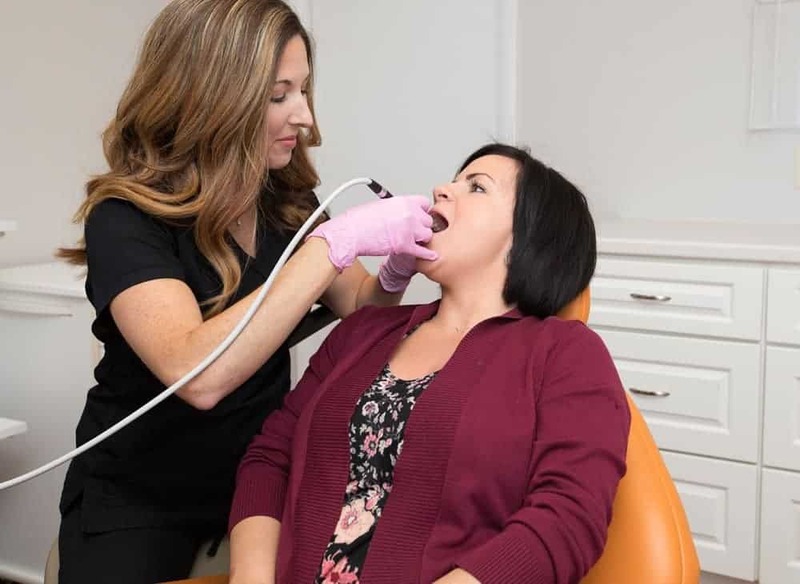 A full-mouth dental restoration is more like a customized treatment plan with the goal of bringinging your mouth back to complete health, balance, and beauty. The Panhandle Dental Care full-mouth restoration begins with a complete exam, evaluation, and discussion of your ideal outcome. We then use a combination of techniques and procedures that treat your smile as a whole. These procedures could include anything from periodontal care, crown lengthening, or gum recontouring to get the foundation of your smile in top shape to dental implants, crowns, veneers, or smile whitening to produce the strong and gorgeous smile you have been wishing for. Every full-mouth restoration is individually tailored to meet each patient’s needs for a brilliant result that will last for years to come. Do you wish you could restore your smile with a porcelain crown, but are worried that your tooth is too broken, short, or decayed to hold one? Don’t worry. 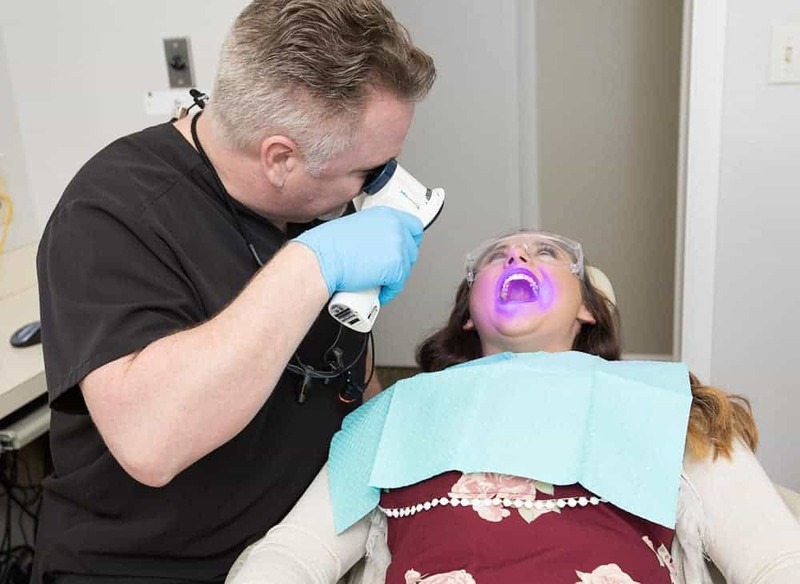 Panhandle Dental Care offers laser-assisted crown lengthening to quickly and easily save your tooth and get it ready for your ideal restoration. We simply sculpt gum tissue away from the enamel that is needed to provide a secure base for your crown or other dental restoration to be bonded to. The laser heals as it works so your porcelain crown or veneer can be placed the same day the crown lengthening procedure is completed. Crown lengthening can also be used to brighten your smile when too much gum tissue is covering it. Most people don’t really think about their gums much – but if your gorgeous teeth are being hidden behind them, they may be the only thing on your mind! Gum overgrowth or irregular gum tissue can make your smile look small, dull, or unbalanced, but there is no reason to live with the embarrassment. Simple gum reshaping from Panhandle Dental is your perfect solution. Dr. Bill Ott is trained and experienced in soft-tissue laser sculpting so there is no cutting or suturing necessary. Just a quick pass with the laser and your gums are reduced, shaped, and beginning to heal. If your medication, genetics, or health issues are causing your gums to obscure your teeth and keep you from smiling, talk to us about gum recontouring today! No one likes walking around with a chipped or cracked tooth. Not only does it make your smile look irregular, isn’t it just impossible to stop touching it with your tongue? It could drive a person crazy! We often recommend composite bonding for this and other less extensive repairs and cosmetic improvements. Why? Cosmetic bonding is an artful technique that uses custom-shaded composite resin to reshape and rejuvenate your smile. Dr. Ott applies the resin bonding material to the area that needs to be perfected, sculpts and shapes it to match your surrounding teeth, hardens the bonding material with a special light, then polishes the area to perfection. The results are so natural-looking and attractive, no one will realize which tooth or teeth have been bonded. In fact, bonding is so natural-looking, it can even be used to cover intrinsic stains when tooth whitening just won’t work. Long canines. Uneven front teeth. A chipped and jagged smile. All of these little imperfections can feel really major when they are affecting your appearance. Don’t let uneven or irregular teeth get you down. Dr. Ott and Panhandle Dental have solved hundreds of these smile dilemmas with quick, convenient, and easy tooth recontouring. Tooth recontouring is a sculpting method that brings all of your enamel to the desired level. Using a steady hand and a precision bur similar to the kind a jeweler uses, Dr. Ott removes areas of unwanted enamel, smooths ridges and sharp edges, and brings your smile line to a look of ideal, balanced harmony. We don’t think anyone in Panama City should have to live with a dull, stained, yellow smile. Not when you can easily whiten your teeth up to ten shades with Panhandle Dental Care’s professional, take-home whitening trays and gels! Over-the-counter whitening methods just can’t match the safety and comfort of our smile whitening. We not only custom create your whitening trays from molds of your teeth so they fit perfectly and keep your gums protected, we also customize the gel to fit your individualized whitening needs. Just fill the trays with your special gel, and in about seven days, your smile will be whiter than you ever imagined it could be. It’s easy to whiten on your commute, while you are relaxing in the evening, or during your lunch break. Smile whitening is a great way to take years off your appearance, prepare for a special occasion, or give yourself a pick-me-up just because you deserve it. Isn’t it time you started using your smile to its full potential? Call to schedule a cosmetic dentistry consultation today!